Do some capital letters on your business card make you an expert? Does their absence make you incompetent? The obvious answer is no. So what possible reason is there to pursue a law degree, earn an accounting designation, earn your professional assocation certification, or for that matter, any other official recognition of accomplishment or learning? Tempering your skills and experience in the fires of the accreditation process. Professional associations weren't created in isolation. They were formed by people who had something to gain from working with others to gain skills, share knowledge and raise the profile of their profession. Accounting has one of the more rigorous accreditation processes, and they've managed to parlay that into credibility in business circles. You'll notice that they focus a lot of attention on improving mangement skills, which doesn't seem to be a focus for business communicators. Maybe that's why they've been so successful. Yet, even with all that rigour, you still see at least three different kinds of accounting designations, and anyone can do accounting without accreditation as long as they don't claim to be accredited. They're called bookkeepers and a number of other names, and they do damn good work. Anything that pushes you to re-examine your methods and prove that the way you do things works is a good thing. Yes, such processes can stifle creativity. If you are approaching public relations projects with some radical new approaches, you may find the people who run the accreditation process don't understand the value of what you're doing, or question your methods. Welcome to the downside of innovation. Is accreditation the only way to show the world you are qualified? Nope. Is it worth pursuing? Only if you think the effort will bring real value to you or increased perceived value to your reputation. Todd Defren argues that because a person with no accreditation can practise public relations with excellence, there's no need to make accreditation mandatory. Kami Huyse argues that accreditation is a valuable step toward becoming a better practitioner. She responds to Defren's comments. Stuart Bruce weighs in, saying accreditation is valuable to the PR profession's credibility. This is a bit of a chicken and the egg debate. You see the same issue in academia, where the qualifications for achieving a doctorate don't necessarily involve learning how to be a good teacher. Then universities set their academics loose on students, explaining that their research skills and quality of dissertation writing qualify them to pass on their learning to others. Teaching takes a whole new range of skills that some academics have, and others are lacking. A PhD. does not magically transform them into an excellent teacher. Accreditation is a good measure of whether someone: 1) Understands the fundamentals of business communications; 2) Has shown they can apply strategic thinking; 3) Decide to devote the time and energy to the process; 4) Values the accrediting organization enough to want to affiliate themselves with the accreditation being offered. There are a lot of people who have 1-2, but don't have either 3 or 4. Update: Todd Andrlik lists the various bloggers' positions on this topic, and creates a comparison table of the various PR accreditations available. Leo Bottary, who authors the Client Services Insights blog, e-mailed to let me know comments were turned off on this post. Not sure how that happened, but I've noticed sometimes Qumana (my blog editing tool) defaults to comments off. I didn't catch that yesterday. Sorry if, like Leo, you tried to leave a comment, and were unable. IABC Launches Blog "Community for Business Communicators"
The redesign of the International Association of Business Communicators' web site was just part of the the group's web revitalization. This weekend they launched IABC Communications Commons, a group of blogs authored by various IABC members and aimed at elevating the discussion about business communications. I'll park my skepticism about the extent to which the blogs will be authored by multiple authors. The IABC Cafe blog got excellent uptake during the last international conference, but after that chair Warren Bickford was left swinging in the breeze by all but one of his guest bloggers. The active involvement of Communication World editor Natasha Spring is a good sign. An effort like this needs the hand of some paid writers, editors and association people, to supplement whatever blog posts are offered up by volunteers (members). The idea of having several blogs on topics that interest and affect IABC members is promising. The fact the discussions will take place in public will possibly limit participation by some of the more timid members, but hopefully IABC finds more than enough authors and readers to create a meeting place for the exchange of ideas and experiences. If you visit the site in the next day or two, don't be put off by the fact long-time IABC member and leader Shel Holtz seems to be a one-person blogging machine there. He created an introductory post for each of the content areas, and for the home page. But that's pretty standard when you're building the template. Once others have stepped up with their blog posts, we'll be able to evaluate The Commons and how well it's living up to its potential. I've already subscribed to the blog feed, and am hoping the site is showing signs of healthy debate by the time my membership gets renewed later this month. Ragan Communications' David Murray critiques IABC Cafe blogger (and board chair) Warren Bickford for writing bland posts, and not doing it often enough, in the December 19 Ragan Report. Reminds me of the complaint about restaurant food: "The food here is terrible! And such small portions!" Last winter, there was a sustained attack by bloggers on then-chair David Kistle for starting a blog, but not seeming to have the energy or inclination to maintain it. This year, despite a lengthy absence from the blog, Bickford hasn't faced the same criticisms. This could have something to do with Bickford's active engagement on the blog over a period of months, the fact he asked several guest bloggers to step in during times when he might not be able to carry the conversation (only Tom Keefe has risen to the occasion), and how open he has been to suggestions, comments and criticism. That kind of behaviour earns you some slack when you need it. Murray's conclusion "A lesson, perhaps: Transparency requires more than a good attitude, but time and energy, too." Mark Ragan steps into the debate, saying that Murray was calling the blog bland, not Bickford. He then goes on to suggest Bickford could be more "exciting" by writing like Steve Crescenzo does. Crescenzo is indeed a lively writer who often takes a provocative stance to get a reaction. Which works for him, but it's not necessarily Bickford's style. Bickford is doing just fine, writing about things that interest him or affect the organization. He has a wry wit that doesn't need to be more exciting, thank you. 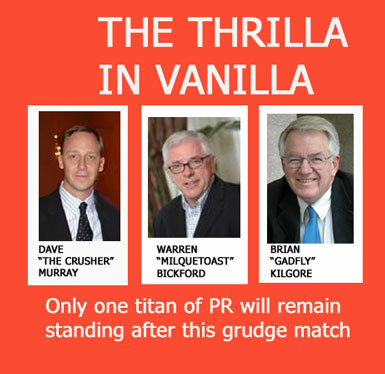 While Murray was taking a jab at the IABC Cafe, he also took a potshot at "Canadian PR man and IABC gadfly Brian Kilgore (who) responds, often multiple times and typically truculently, to virtually every entry. We do not fault bloggers for ignoring such people. We might not even fault them for removing their posts." Nothing like poking at a hornet's nest to stir up interest. Allan Jenkins is calling on bloggers and communicators to spend more time and energy doing something useful about disasters like Hurricane Katrina. So what can IABC and its members, PRSA and its members, any communicator -- or any one of us, for that matter, do to help this effort? Well, we can donate (our) time. Plenty of information about that on the Wiki. We can also donate money or services to keep the effort going. It's a volunteer effort, and they are using free software (Blogger, Skype, etc) but there are some hosting costs. You can read more about their needs here. Microcontributions or contributions-in-kind appear welcome. The lesson here for communicators? Bloggers and micro-media users -- real communicators -- can make a difference. It's a question of rapid organization and will. We don't have the tools is no longer an excuse for us. Communications measurement guru Angela Sinickas will be in Saskatoon October 18 for a half-day workshop called "How to Measure Your Communication Programs: Developing An Ongoing Process." A luncheon presentation on "Calculating the ROI on Your Communications" is included in the $199 fee, or can be attended separately ($40, or $25 for IABC/CPRS members). If you haven't had a chance to catch Sinickas at a conference or webinar, this session is definitely worth checking out. She takes a very no-nonsense approach to measurement, recognizing that not everyone has a big budget for extensive surveys and focus groups. The luncheon starts at 11:45 a.m., at Saskatoon City Hospital, with the workshop to follow. Contact gloria.suchar@saskatoonhealthregion.ca by October 12 for registration. There's a tendency on the Internet to make personal attacks, when in fact you merely disagree with the ideas or the methods another person uses. So it was refreshing the other day to read Shel Holtz's lengthy rebuttal of T.J Larkin's theories about employee communications, as espoused during a speech at the IABC International Conference in Washington, D.C.
Holtz gets in quite a few body blows, but I think he gives Larkin the respect of doing a blow-by-blow rebuttal of his use of research to support his business communications theories. It would have been easy just to disparage Larkin without explaining exactly how and why Holtz feels he is wrong. attendees themselves is refreshing for a number of reasons (see The IABC Cafe)..
the comments that seem credible to you. Stories about travel conditions, networking, and the mechanics of being at the conference, added a human touch to the coverage. There's coverage about an event while it's still happening. This adds to the sense of reading about a real event, rather than a curt summary of what the main speakers had to say. The incoming chair of IABC (Regina's Warren Bickford) actually gave a lukewarm review to keynote speakers James Carville and Mary Matalin. How's that for transparency? The representative leader of the organization making an honest comment about the content of the conference. The opposite of corporate bafflegab, and refreshing to hear. Full frontal photo of Warren Bickford and David Kistle. Bickford's decision to pass off conference coverage to his posse of correspondents was brilliant. At a conference with 1,300+ people, the chair of the organization has to do a lot of in the flesh meet and greet, attend meetings, and so on. He didn't have lots of time for blog postings, and wisely had others available to pick up the slack. A good idea, and something to consider as the year progresses and Bickford finds his schedule gets in the way of regular blog postings. My rating of the coverage: Hey, that would be too easy. Go to IABC Cafe and make up your own mind. The lesson to be learned from IABC's choice of a four word lengthy tag for tracking postings and photos seems to be: if it isn't simple, it won't work. All the tagged items so far on Technorati are from IABC's own blog. No one else who's blogging of posting photos about the IABC international conference being held in Washington D.C. have been able to figure out how to make their tags match the one IABC suggests. Compare that to the technology conference Gnomedex, which had hundreds of tagged postings, and you can see that simplicity pays. Update: Chris Hall, the web guy handling IABC's blog, suggests I might be nitpicking to worry about whether Technorati tags are functioning the way they're intended. He also suggests I not assume the problem lies with IABC the next time anything doesn't appear to be working. Fair enough. Any technorati tags about the IABC conference that used all four words in sequence showed up fine if you searched for all four words. And anyone who was guessing at the possible word combination to use as a tag still had a good likelihood of successfully searching for postings if they used "iabc conference" or some similar search that used a couple of the words from the four-word tag. The New York Law Journal reports that the Public Relations Society of America and its COO Catherine Bolton are pursuing a lawsuit against a former PRSA employee who sent what he or she thought was an anonymous e-mail about Bolton to members of the board of directors. Though there has been some coverage in subscription-only Jack O'Dwyer's Newsletter, the only other mentions on the Internet are a note by PR executive Ken Kerrigan in a blog posting June 24 that doesn't offer many details, and the New York Law Journal report. The Law Journal says Bolton won a court action to have a Time-Warner-owned Internet service provider reveal the identity of the person whose e-mail account was used to send the critical e-mail. However, the PRSA as an organization was turned down in its request, so if the suit proceeds, the PRSA is unlikely to be a direct party to it. The ISP didn't make a court appearance, but a lawyer for the anonymous e-mailer argued against releasing the information. The e-mail stated, among other things, that the Public Relations Society of America's director Catherine A. Bolton "is a fast-talking nonstrategic PR person. She cannot manage or lead an organization. Her quarterly reports to staff are garbage, often met with rolling eyes," according to Justice Kibbie F. Payne's decision, Public Relations Society of America v. Road Runner High Speed Online, 116210/04. Getting the name of the person who controlled the e-mail account is a precursor to a defamation suit, the Law Journal reports. I fail to understand how concerns about the performance of a senior officer at an organization sent anonymously to board members could negatively impact governance, as PRSA has publicly stated as a cause for their concern. Isn't such "whistle blowing" and the response such a communication receives from a board a test of effective governance in the first place? In an interesting twist, their pursuit of the e-mailer's identity has caused quotes from the e-mail to be published. You would think they would want to limit the distribution of the contents of the e-mail. The PRSA doesn't appear to have any information about the pending lawsuit on its web site, which is similar to the low profile maintained by the International Association of Business Communicators when their former CEO Elizabeth Allen sued acting president Lou Williams for defamation. I can't imagine a situation where a public lawsuit about an e-mail between an employee of the organization and its board members will improve the PRSA's image. Some organizations encourage feedback on their leadership, and accept the occasional poisoned pen letter as part of the anonymous feedback process. I guess that's not the case with the PRSA. "I don’t think there is a right answer at the moment to the question of what delivering transparent communications means. As someone pointed out at the conference, the appropriate response to a lot of questions is often “It all depends.” But talking about it, at a conference, or in a blog, or to your colleagues, is the right thing to do. "Personally, I think that honesty is always the best policy. It seems simple enough, but it’s amazing how many people’s knee-jerk response is the opposite. I see my role as being to ensure that the messages that make up the stories I tell are the truth. And I know that if they aren’t, someone is going to figure that out." My point in the same comments section is that "be honest" implies a stronger moral imperative than "tell the truth," which leaves you open to many sins of omission. Check out more of Dave's writing on The Daily Upload, or check out Warren Bickford's coverage of the The Naked Communicator workshop: Day 1, Day 2.